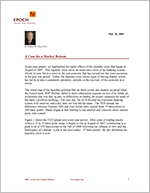 A Case for a Market Bottom - Epoch Investment Partners, Inc. In previous papers, we highlighted the ripple effects of the liquidity crisis that began in August of 2007. This liquidity crisis led to an insolvency crisis of the banking system, which, in turn, led to a crisis in the real economy that has turned into the worst recession in the post war period. Today, the liquidity crisis shows signs of having abated, which has led us to take a cautiously optimistic outlook on the recovery of the economy as a whole. The initial sign of the liquidity problem that set these events into motion occurred when the French bank, BNP Paribas, failed to meet redemption requests on two of its funds: an occurrence that was due, in part, to difficulties in finding the proper valuation for some of the bank’s portfolio holdings. The next day, the ECB flooded the European banking system with reserves, and a day later our Fed did the same. The TED spread, the difference between Treasury bills and Euro dollar rates, soared from 75 basis points to 200 basis points. Banks began to fear lending to one another and concerns about counter party risks soared. Figure 1 shows the TED spread over a ten year period. After years of trading mostly within a 25 to 75 basis point range, it began to rise in August of 2007, culminating in a peak level of 454 basis points in the Fall of 2008 following the collapse of AIG and the bankruptcy of Lehman. Look at the level today– 57 basis points! By this definition the liquidity crisis is over. Despite the waning of the liquidity crisis, the aforementioned ripple effects within the banking system and the real economy continue to wreak havoc on the financial system at large. The IMF’s most recent credit loss estimates have risen five times, from an initial $800 billion estimate in April 2008 to $4 trillion in May 2009. The shadow banking system has collapsed, ushering in a huge rise in defaults in almost every credit area, as shown in Figures 2 and 3. In recent months, however, much capital has been raised to offset this problem and, combined with central bank policies, including liability guarantees, the banking system is now off its death bed. Figure 4 reflects the Financial Business Conditions Index1 created by Bloomberg. Both the liquidity crisis and the solvency crisis can be seen in this one chart, as can the healing process that has taken place since the start of 2009. A recent window into the improving credit market was Wal-Mart’s issuance of $1 billion of debt on May 14th at the lowest yield relative to benchmark rates that it paid since credit markets seized in 2007. In this instance, five-year securities were sold at 3.2% or 125 basis points over Treasuries with the same maturity. This, among other signs of a strengthening financial system, is evidence that, although the credit crisis is certainly not over, the credit market is on its way to recovery. It has a long way to go to return to the levels of the summer of 2007, but we can feel encouraged by the fact that recent monetary and fiscal policies are already having tangibly positive effects. Another way to look at Figure 4 is to see it as an index that reflects the cost of capital. When the index falls, the cost of capital rises, and when the index rises, the cost of capital falls. The falling cost of capital in the credit markets has been hugely important over the past few weeks. Microsoft, for example, recently raised $4 billion: an influx of capital that, from a purely operational perspective, the company doesn’t really need. But consider what would occur if Microsoft bought stock with these proceeds. The stock price would rise. So, for Microsoft and many other firms for which the cost of equity capital exceeds the cost of fixed income capital, there is a valuable arbitrage opportunity at work. If you are a highly rated company, in other words, why not issue debt and buy back one’s stock? To be honest, I have no idea why Microsoft raised the money; there could be any number of justifications, including acquisitions, an adherence to financial conservatism, or simply because the money was there for the taking. I do know, however, that they can instantly increase shareholder value simply by repurchasing stock at current levels. Because of the rapid improvement in the credit markets over the past two weeks, there is reason to believe the market lows of March will hold, barring a worsening picture for the real economy. We still have a deteriorating real economy. Real growth is still negative, housing prices are still declining, and employment is still falling. A real market bottom will ultimately depend on real growth, including productivity and work force expansion, stabilizing profit margins, and personal income growth. Currently, expectations are that these variables will become positive next year, but from low bases. And, should these expectations hold true, March will indeed prove to have been the bottom. We have dealt with the liquidity problem and now appear on our way to working through the solvency problem. If Figure 5 is a guide, we are more than halfway through the recession and the future, therefore, looks brighter than it did just a few months prior. From this historical perspective, markets usually bottom two thirds of the way through a recession. As shown below, this currently appears to be the case. In the context of a $50 trillion hit to the world’s global balance sheet in less than 18 months, no one should expect a V-shaped economic recovery. It will be more like an “L” or even “W” where the first, modest rise is inventory restocking, with the second, more meaningful rise associated with the growth of the real economy in 2011 and 2012. In this scenario, the equity market should provide a positive return, albeit a modest one. How modest? Let us take a look at the results presented in a paper by Elroy Dimson and CSFB published in February 2009. In their analysis of 100 years of data, Dimson and CSFB present Figure 6 as a suggestion of what future equity returns could look like. Figure 6 is a histogram of returns for two, five, and ten-year periods following negative 10-year real equity returns. According to the graph, there is a 15% chance after two years that the annual returns for equities will be about 5%, a 30% chance it will be 10% over five years, and a 50% chance it will be just under 15% over ten years. All in all, this outlook is a positive one. We can build expectations another way, as well. Let us begin with the market’s current cash dividend yield of over 3.0%. Add to that number a future earnings growth rate assumption. Historically, we know that nominal GDP and earnings growth rates are closely correlated. In other words, these growth rates will be very similar over time. If one believes nominal GDP will grow 5%, a reasonable estimate for long-term earnings growth would be the same number. The sum of the growth rate for earnings and the present dividend yield suggests an equity return of 8% per annum, before we take into account P/E ratio changes, which will be driven largely by interest rates. Over time, interest rates and P/E ratios are highly correlated in the sense that when interest rates fall, P/E ratios rise and vice versa. Over time (50 years in our examination) the correlation coefficient is about -0.8. Square that number, and it suggests that about two-thirds of the change in P/Es is explained by changes in interest rates. With interest rates where they are today, one might assume that their future direction will be flat to up, and, hence, flat to down for P/E ratios. Taking all this into account, future market returns are likely to be positive but muted, especially compared to returns in the 1980s and 1990s when the S&P compounded at 17.6% per year. Returns for the decade beginning in 2010, however, will be better than those of the current decade (2000-2009), which will be negative. The storm, therefore, may not yet be over, but the worst is likely behind us.